On a side note, I realise we’ve been talking about blushes quite a bit in recent times. Can’t help talking about my first makeup love 😀 I just have a thing for them. Which explains why I had to have both of the Cherie Bow ones, the moment I laid eyes on them at the counter. There were 2 blushes released in the Cherie Bow collection – 729 Pink Happiness and 659 Tender Coral. As the whole collection was quite pink overall, I was pleased to see the inclusion of a coral toned blush. It warmed up the collection. As the names imply, 729 Pink Happiness is a pink blush. In pan, Pink Happiness looks like a deep rosy pink on the matte side, and a light shimmery pink on the highlight side. I however found that despite looking quite pigmented in pan, it was, in actual fact, very sheer and light on skin. Unlikes previous versions, I found the texture hard to touch, which surprised me somewhat. When I use a brush, I do have to lightly brush the surface of the blush a couple of times to get the colour on the brush and then on my cheeks. I use the Lunasol Cheek Brush which although soft, manages to grab the colours quite well off the blush and deposit it on cheeks. The colour when deposited on skin, is a lovely soft pink. The shimmer isn’t overwhelming and the colour isn’t very bright. It in fact, gives you a lovely glow. 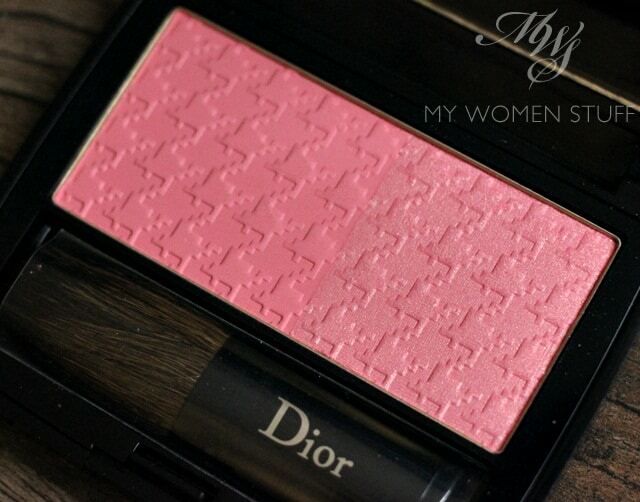 However, if this is your first Diorblush, I will warn you that you may feel a bit disappointed. As I have said, I found that the texture wasn’t quite the same as the regular Diorblush. This is harder and sheerer which doesn’t bother me one bit, but may bother some. It is my belief that this is why some people who have tried Pink Happiness aren’t as impressed with it as I am. Comes down to the texture. You may probably notice that it looks very light in the swatch and I will have to tell you that it takes at least 3 layers for it to show up pigmented enough on my hand to take a picture. On cheeks, I don’t go for that sort of intensity so it takes maybe 2 layers for a pretty glow. Tender Coral 659 on the other hand, has a different texture. In pan, Tender Coral is a matte coral pink on one side and a shimmery coral pink on the other. It is significantly warmer in tone than Pink Happiness and adds a lovely warmth to the skin. I found that texture wise, Tender Coral is markedly softer and more pigmented than Pink Happiness. 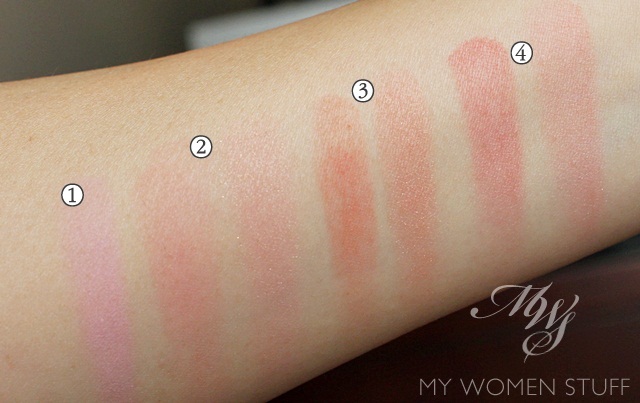 This is closer to what the regular Diorblush texture is like and it takes less for the colour to show up on skin. In fact, when I use Tender Coral, I am careful to dab my brush on the surface and then tap off excess colour before applying to cheeks. With Pink Happiness, I don’t do that or I’d lose the colour. When swatching, one layer shows up the colour well enough. So, I’d say that this one may please more people in terms of pigment and colour selection because it quite easily suits most skintones. 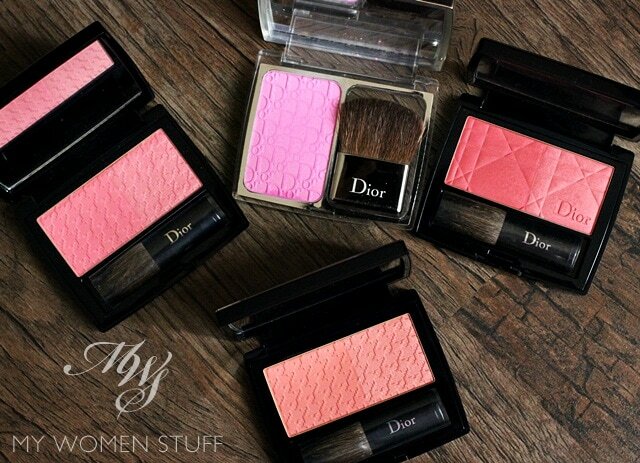 I had a request in the Dior Cherie Bow overview post, to compare the blushes with one of my favourites, the Dior Rosy Glow blush in Petal from Spring 2012 (and which is now permanently available at counters). I found another blush I thought was similar in tone as well in Pink in Love. Visually, Pink Happiness is a warm pink while Healthy Glow Petal is markedly cool toned in the pan. However, the Healthy Glow Petal blush has an ability to morph its colour to suit different skin tones (to a degree) so its colour in pan is perhaps not as indicative of its color as it should be. I thought off hand that Pink in Love might be similar to Tender Coral but it would appear that the former has more red tones in it while Tender Coral has more peachy tones. The swatches bear out this difference as well. 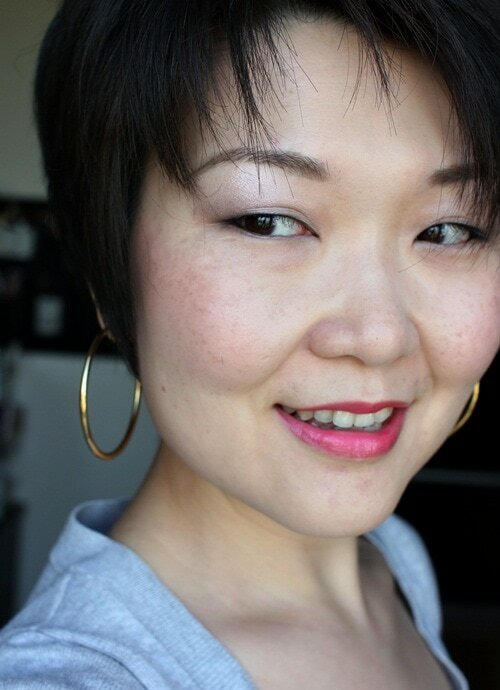 Just quickly, here’s how the 2 Cherie Bow blushes look on me starting with Pink Happiness. A note about the Dior Pink Ballerina palette, if I may. It isn’t one of my favourite palettes but I have to say that it is imminently a very wearable palette for an everyday look if you ensure that you define your eyes by lining it. Its not a palette I’d tell you to run out and buy, but if you do like these sorts of glowy sheer shades, do take a look because its lovely for that. 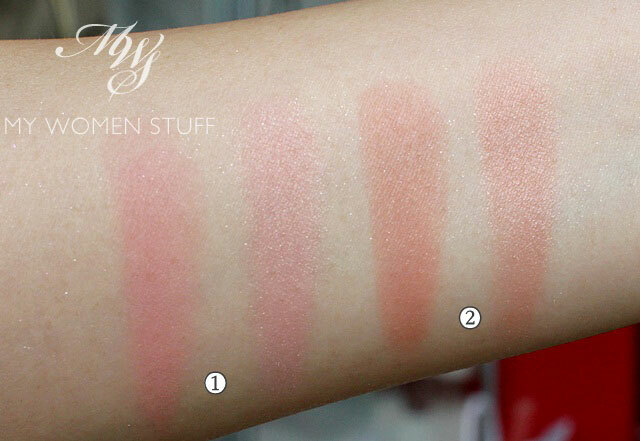 You may be able to see how the 2 blush shades differ in these 2 photos. Pink Happiness gives a soft pink glow to the cheeks and lifts the complexion. Tender Coral adds a warmer glow to the skin and importantly for me, does not pull orange. Sometimes, coral blushes do that on my skin – turn orange and I look too tanned or sunburnt. Tender Coral is just right – a tender flush of warm coral pink tones on skin! The Cherie Bow Collection Diorblush in Pink Happiness and Tender Coral are limited edition blushes and are embossed with a houndstooth pattern. The quality of the blushes are for me, up to the mark but they do tend towards being more sheer and glowy as opposed to strongly pigmented. So whether you’d like these will depend on whether you like sheerer blushes or more strong coloured ones. The texture is lovely and fine and deposits well on skin. I do find that Pink Happiness feels harder than Tender Coral and thus is lighter on skin but I can work with it so I have no complaints about either at all. 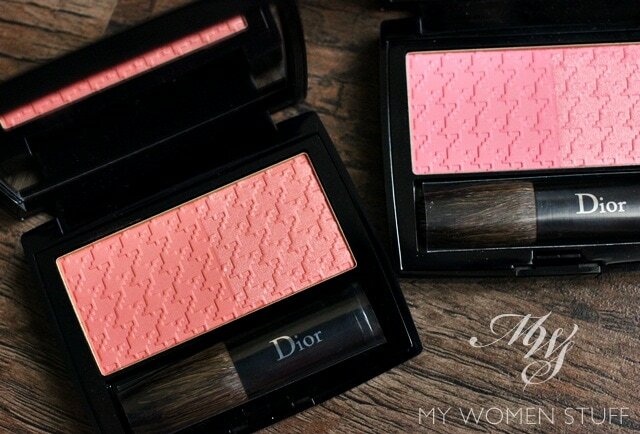 Have you checked out either of the Cherie Bow Collection Diorblush? Which shade do you prefer? Disclosure: Pink Happiness was provided by PR for consideration. For posting guidelines please read my disclaimer. NEXT POST: Beauty Storage Options: Drawers from Muji solved my messy problem! Love the pink happiness. However, the color sort of fade away after 3 to 4 hours later. Not sure why but I didn’t have problem using Lancome Blush Subtil blushes. Do you? Hi Sam, no I don’t have problems with fading with the Dior. Then again, I rarely have trouble with fading for most brands of powder blushes.